What’s the big deal with Romans and their concrete? While much of our modern infrastructure is crumbling beneath us, the concrete with which the Romans built their empire endures still. Their secret—and the source of the term “pozzolan”—was a fine-grained pumice they first sourced from Pozzuoli in Italy and mixed into their concrete formulations. 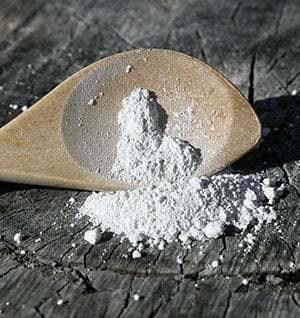 Society widely “rediscovered” the benefits of pozzolanic concrete when the coal-fired power generation industry was looking for a market to use the fly ash they were scrubbing from their stacks. Yes, it works as a replacement pozzolan, but the original is even better. HessPozz is the same natural, sustainable pumice pozzolan the Romans used—but carefully refined—resulting in a pozz that significantly enhances concrete chemistry and performs consistently, pour after pour. What was lost has been found. What was old in new again. Infuse your concrete with the “new” Roman concrete technology. Why is pumice rarely mentioned in legacy literature discussing supplemental cementing materials (SCM)? 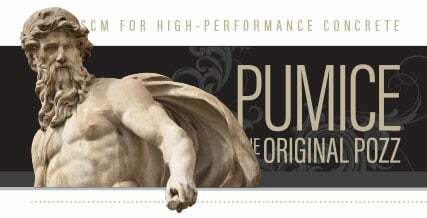 More than a century ago pumice was identified as the key ingredient in the impressively durable and ageless Roman concrete. Even as recent as early and mid-twentieth century, finely ground pumice was used in the building of mass concrete structures—the Los Angeles aqueduct (1912), Friant Dam (1942), Altus Dam (1945), and the Glen Canyon Dam (1964). However, modern markets didn’t demand investment in the kind of high-end concrete that required a refined pumice pozzolan. Without that demand, the quantifying research wasn't done. By the time the longevity problems of ordinary Portland cement were felt acutely and the need for pozzolan was fully (re)understood, a cheap by-product with pozzolanic qualities, in the form of coal combustion residuals (fly ash), was readily available. Concrete savvy has come a long way since the twenties, and, coupled with a the quality and availability issues of fly ash, pumice pozzolan is in position to re-take its rightful place as the premier concrete pozzolan. The quantifying research has been done. The product supply is consistent and stable. The in-concrete performance checks every box in every critical performance category—including density and strength, ASR mitigation, and class 3 sulfate resistance. Now, those who must have the high-performance concrete, free from hazardous materials, white in color, and economical to source, choose HessPozz. Let us send you a sample to test and see firsthand. What are the best reasons to use HessPozz? The pumice pozzolan from HessPozz measures up exceptionally well against other supplemental cementitious material (SCM) options on the market, including fly ash, silica fume and metakaolin. We’ve prepared a scorecard showing how HessPozz performs against other available SCMs. How reliable is the HessPozz supply? Hess has been a family-owned company delivering reliable service for more than five decades. The company promise of “On-spec, On-time” has given customers confidence for equally as long. Our Wright’s Creek area pumice mine in Southeast Idaho, USA has a confirmed yield of millions of tons. I have experience with fly ash. How does HessPozz performance compare? The full University of Texas-Austin report, “Evaluating the Performance of Alternative Supplementary Cementing Material in Concrete,” is available from downloads area of this site. Where is HessPozz being used? Perhaps the most demanding environments in which HessPozz is currently being used are in the specialized cements needed for oil well concrete casings. Our pozz strengthens and protects oil well encasements from deep below the North Sea to the wind-swept plains of Colorado and Montana and from the sands of Arabia to the harsh tundra of the Great White North. Oil well cementers prefer HessPozz because it makes concrete highly resistant to sulfate and chloride attack, exhibits minimal thermal cracking, cures to form a nearly impermeable barrier, performs predictably, and continues to strengthen and fortify indefinitely due to its pure pumice pozzolanic charge. Hess UltraPozz was chosen by Sandia National Laboratories to provide the pozzolanic charge when formulating the ultrafine cementitious grout needed to seal the stress microfractures in the deep repository tunnel openings at the U.S. Department of Energy's Waste Isolation Pilot Plant (WIPP). The formulation developed by Sandia scientists is now produced commercially by U.S. Grout. The grout uses Hess UltraPozz to increase the impermeability and durability of the injectable grout for uses such as soil stabilization, to seal storage caverns, tunnels, and dam aprons against water ingress, and to create impermeable leachate barriers in containment ponds and underground storage caverns. HessPozz is used in cultured stone products, GRFC board forms and architectural panels, and in LimeStrong™, a unique pozzolan-lime plaster product. What are the environmental benefits of using HessPozz? HessPozz is made by carefully refining a clean, pure pumice—an amorphous white stone created from volcanic events millennia ago. It is not a by-product of pollution control processes. It contains no hazardous materials. It is a natural pozzolan, born in the bowels of Nature’s most fearsome monument—volcanos—and so is naturally calcined and does not need high-temperature firing to attain it's useful properties. Pumice pozz is safe, effective, and abundant. In typical applications, HessPozz replaces 20% of the Portland cement typically needed in the concrete mix design, thus reducing, on a pound for pound basis, the colossal carbon footprint standard cement leaves behind. The loss of early compressive strength when using SCMs can be attributed to the dilutionary effect from replacing a percentage of cement with pozz, and, if necessary, can be mostly compensated for by using a pumice with a smaller particle size (UltraPozz). U of Texas-Austin research showed that Hess UltraPozz samples had a 1-day strength that was about 90% of the OPC control, with the Hess StandardPozz strengths coming in approximately 75% of control. The rapid strength gain of UltraPozz concrete continues, reaching that of the OPC control by day 7 and by day 28, strength had exceeded control by 40%. Hess StandardPozz strengths reached OPC control strength at 28 days. By 90 days, the strength of HessPozz standard specimens exceeded control by some 20%. By 365 days, the strength difference between the two pumice pozzolans was significantly tighter than the spread at 90 days, indicating that the benefits of the smaller particle size diminish over time and that long-term strength is dependent on the reactivity level of the pozzolan. At the year mark, compressive strength (Mpa) numbers came in at 42 for OPC control, 60 for UltraPozz, and 56 for StandardPozz. Can “high-early” concrete be formulated using Hess Pozzolans? Absolutely. Our Hess UltraPozz is ideal for such formulations. UltraPozz is truly the ultimate pozzolan, making possible a high-early, high-performance concrete that also checks off every box on the list of desired results. How effective is pumice-blended cement for mitigating the Alkali-Silica Reaction (ASR)? In what quantities can HessPozz be purchased and packaged? Hess regularly ships products in quantities as small as two grams and in bulk trucks and rail cars up to 100 tons of weight. We package in 50-pound sacks or one-ton bags. Hess ships to six continents and consistently delivers on-spec and on-time. Whatever you need, we’ll get it there. Where is HessPozz mined and manufactured? HessPozz is mined and refined in Malad City, Idaho USA from a superior pumice deposit—the purest commercial deposit of white pumice in the world. Where did the term “pozzolan” come from? The word “pozzolan” is derived from the term “pozzolanic ash”, or pozzolana, which the Romans used with their hydrated lime cement to produce their incredibly durable concrete. The designation pozzolana was derived from one of the primary deposits of volcanic ash (pumice) used by the Romans in Italy, at Pozzuoli. In modern use, “pozzolan” is loosely used to refer to any supplemental cementing material, regardless of origin, that creates the same beneficial pozzolanic reaction within curing concrete as does the original volcanic ash (pumice) known to the Romans as pozzolana. I've heard pumice-enhanced concrete is hard to work with. Is that true? When finishing flatwork, that can indeed be the case. Because of the toothy, grippy nature of pumice powder, pumice-enhanced concrete may require additional effort during the finishing process than is typically needed with other SCM-enhanced concretes. However, this is not always the case. As with all concrete, the amount of finishing effort is determined by the type of finish desired. If you're placing and vibrating the concrete into forms, then you'll encounter no placement problems (with the proper slump, of course). Like any SCM-enhanced concrete, the key to trouble-free placement lies in the mix design. Pumice pozzolan mix designs remain very workable and have a slightly longer set time (45 to 80 minutes) that 100% ordinary Portland cement (OPC) concrete. The longer set times are directly related to the reduced amount of OPC used in the mix design. Of particular note, the extended set time returns value by significantly mitigating heat-of-hydration cracking. Quicker set times and high-early strength can be engineered into the mix design with the use of a water-reducing agent without compromising the broad-spectrum performance boost from the reaction ignited by the HessPozz. Is there an ASTM specification for testing natural pozzolan-based mix designs? Currently there is not a specific standard for testing natural pozzolans. The American Society for Testing and Materials (ASTM) organization has recognized the need to develop a specification standard specific to natural pozzolans and is currently working on developing that standard. As for now, natural pozzolans are lumped under the ASTM C618 spec—a specification standard that was developed for coal fly ash. The problem is this: clean, natural, consistently-performing SCMs are significantly different from by-product SCMs scrubbed from industrial processes. ASTM C618, developed specifically for fly ash, is designed to test and account for the inconsistent nature of by-product SCMs. Applying the same standard to dependable pozzolanic materials that don't need such exhaustive vetting processes is unnecessarily burdensome. 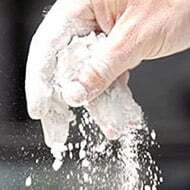 We anticipate this new standard will help expand and smooth the use of natural SCMs (like pumice) in the marketplace. Such a standard will be especially useful for government agencies that use various contractors for public works projects and rely on and require strict adherence to such standards. The primary chemical reaction in curing concrete is known as “hydration,” in which the major compounds in cement form chemical bonds with water molecules and become hydrates or hydration products. One of these products is bad-boy Calcium Hydroxide (CH), which is not cementitious and thus contributes nothing to concrete bond-strength. Even worse, CH is actively deleterious, causing a host of ills that contribute directly to concrete durability problems. The pozzolanic reaction is a secondary reaction that takes place within the hydrated concrete paste. Pumice pozzolan, while not cementitious itself, reacts with the CH consuming it and repurposing it to form additional Calcium Silicate Hydrate (C-S-H), the binding chemical glue that makes concrete what it is. Think of the pozzolanic reaction as a molecular reclamation process: taking a trouble-making compound and turning it into a contributing, performance-amping compound. The pozzolanic reaction will continue for months, even years, adding binding strength and durability by continually densifying the concrete matrix until either the CH or the pumice pozzolan is consumed. Bearing out this point is the University of Texas-Austin study that found the mix designs using HessPozz provided superior compressive strength results at 365 days, besting fly ash, metakolin, expanded shale, and of course, the OPC control. What's the Deal With Romans and Pozzolan? Why is Pumice Rarely Mentioned as a Pozz in Legacy Literature? Best Reasons to Use HessPozz? I Know Fly Ash. How Does HessPozz Compare? Are There Environmental Benefits to Using HessPozz? Can I Formulate High-Early Concrete? How Effective at Mitigating ASR? What Quantities and Package Sizes? Is pumice-enhanced concrete hard to work with? ASTM spec for natural pozzolans? HessPozz scores a GE brightness of 84, perfect for applications where color matters, such as in cast stone veneer products.